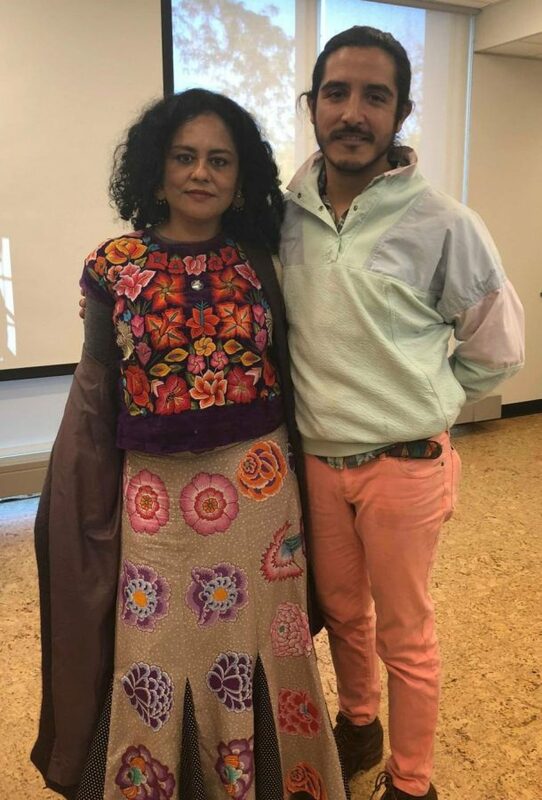 Oaxacan Zapotec poet Natalia Paz Toledo with friend. Photo by Robert Kukla. On Oct. 18, NEIU students, faculty and visitants came to the Angelina Pedroso Center for Diversity and Intercultural Affairs to see Oaxacan Zapotec poet Natalia Paz Toledo read poems from her award-winning poetry book, “The Black Flower and Other Zapotec Poems,” which was followed with an interview with NEIU writer and senior Lizett Carmona. The NEIU English department, the creative writing minor’s literary series “82”, world languages and culture and the Angelina Pedroso Center for Diversity and Intercultural Affairs partnered with MAKE Literary Productions to have Toledo read trilingual poesy and discuss topics based on readings of her written poems. Toledo read “House of my dreams,” “Origin,” and other poems. Toledo’s reading of Zapotec poems were translated by interpreters, both specializing in Spanish and English translation. MAKE Literary Productions and Lit and Luz Festival of language, literature and art commemorate the fifth year of uniting artists and writers residing from Mexico and Chicago to wed ideas on Latin-American culture and the multimedia arts. The dissociation of U.S. and Mexico correlations started Lit and Luz’s 2018 “Assembly” theme to spark conversation among festival goers and encourage artists and writers to speak on issues through the creation of visual art and written works. Toledo was one of the well-known Mexican writers included in this year’s Lit and Luz festival. Ida Kozlowska-Day stated Toledo as “one of the most recognized contemporary poets in the native languages of Mexico.” Toledo is the first woman to write poetry in the Zapotec language. Toledo’s book, “The Black Flower and Other Zapotec Poems” won the Nezhualcóyotl Prize, Mexico’s distinguished prized for indigenous-language literature in 2004. Toledo speaks Spanish and the Zapotec language to connect with her indigenous culture and make the language visible to non-native speakers. “When I left my hometown at eight years old, I felt my skin detach. I started to look for that torn body. I continued to look and reconstruct everything I have left behind. I began to write about my childhood. Writing in Zapotec allowed me to survive in the city,” Toledo said in an email. According to anthropologist Mary I. O’Connor’s, “Mixtec Evangelicals: Globalization, Migration, and Religious Change in an Oaxacan Indigenous group,” the indigenous people are under the control of forces that they cannot wholly understand: globalization. In a world where cash is king, tradition and identity are easily reinvented for a life that better suits the capitalist environment. The indigenous people are now forced to incorporate two cultures into their identity, in the process becoming a people of two nations. A student with a different perspective of the event stressed on the importance of Toledo’s visit to NEIU and how her visit impacts students from other cultures.